পুৰস্কাৰৰ ধন ২০১৭ৰ অক্টোবৰতেই ঘোষণা কৰা হৈছিল. ↑ "Ethics: Executive Committee unanimously supports recommendation to publish report on 2018/2022 FIFA World Cup bidding process" (Press release). FIFA. 19 December 2014. https://www.fifa.com/aboutfifa/organisation/news/newsid=2494723/index.html. ↑ Morrin, Siobhan (13 June 2018). "Your Ultimate Guide to Watching the 2018 World Cup". http://time.com/5310099/world-cup-russia-watch-teams-players/. ↑ "What is VAR, what are the rules, and how is it being used by FIFA for World Cup 2018 in Russia?". The Telegraph. 11 July 2018. https://www.telegraph.co.uk/world-cup/0/var-rules-used-fifa-world-cup-2018-russia/. ↑ Campbell, Paul (22 May 2018). "Will VAR improve the World Cup?". https://www.theguardian.com/football/2018/may/22/var-video-referees-world-cup-russia. ↑ "Russia united for 2018 FIFA World Cup Host Cities announcement". FIFA. 29 September 2012. https://www.fifa.com/worldcup/russia2018/news/newsid=1711839/index.html. ↑ Reineking, Jim (12 June 2018). "FIFA World Cup 2018: Notable teams that failed to qualify". USA Today. https://www.usatoday.com/story/sports/soccer/worldcup/2018/06/11/world-cup-2018-notable-teams-failed-qualify-usmnt-italy/675930002/. ↑ "FIFA/Coca-Cola World Ranking". FIFA. 7 June 2018. https://www.fifa.com/fifa-world-ranking/ranking-table/men/index.html. ↑ "World Cup 2018 stadiums: A guide to the venues of this summer's tournament". The Telegraph. 30 May 2018. https://www.telegraph.co.uk/world-cup/0/world-cup-2018-stadium-guide-summers-tournament/. ↑ "FIFA World Cup Prize Money". FIFA. 27 October 2017. http://resources.fifa.com/mm/document/affederation/fifacouncil/02/91/78/09/fwcprizemoney_2014v2018_neutral.pdf. 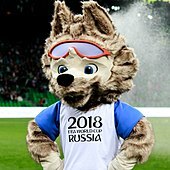 ↑ "Russia 2018: World Cup mascot Zabivaka the wolf unveiled in Moscow". 21 October 2016. https://www.theguardian.com/football/2016/oct/21/russia-2018-zabivaka-world-cup-mascot. ↑ "2018 FIFA World Cup official match ball unveiled: an exciting re-imagining". FIFA. 9 November 2017. https://www.fifa.com/worldcup/news/2018-fifa-world-cuptm-official-match-ball-unveiled-an-exciting-re-imag-2919272. ↑ "adidas Football Reveals Official Match Ball for the Knockout Stage of the 2018 FIFA World Cup Russia". FIFA. 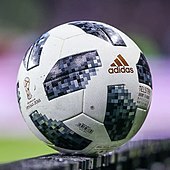 26 June 2018. https://www.fifa.com/worldcup/news/adidas-football-reveals-official-match-ball-for-the-knockout-stage-of-the-2018-f.
↑ "2018 FIFA World Cup Russia Official Song 'Live It Up' to be performed by all-star line-up". FIFA. 23 May 2018. Archived from the original on 29 May 2018. https://www.fifa.com/worldcup/news/2018-fifa-world-cup-russiatm-official-song-live-it-up-to-be-performed-by-all-sta.